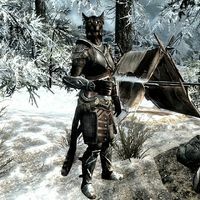 Ra'zhinda is a Khajiit warrior who travels with the trade caravan with Ma'dran and Ma'jhad, between Solitude and Windhelm. Ra'zhinda wears a set of steel armor, including a pair of steel gauntlets (two variants), and a pair of steel boots (two variants). She is equipped with a steel sword and a steel shield, and carries a selection of common loot and gold. The faction and class details seem to suggest that Ra'zhinda should offer Lockpicking training, but there is no dialogue option for it. This page was last modified on 15 November 2018, at 21:03.